Hot melt adhesive is a solid at room temperature, heated to a certain temperature, then melted into a liquid, after coating, wetting the adherend, after the press, cooling, adhesive can be quickly completed adhesive. In most cases, the hot-melt adhesive is water-free or solvent-based and is a 100% solids adhesive. Because of its low pollution, high initial viscosity and quick stickiness, it is widely welcomed by the modern automation industry and has been widely used in books, such as wireless binding, packaging sealing, footwear, and textiles. Hot-melt adhesives can be divided into ethylene-vinyl acetate copolymer resin hot-melt adhesives; polyethylene and ethylene copolymer hot-melt adhesives; polypropylene hot melt adhesives; polyester hot-melt adhesives; polyamide hot-melt adhesives; Polyurethane hot melt adhesives; styrene hot melt adhesives, etc. Polyurethane (PU) adhesives for polyurethane hot melt adhesives have excellent overall properties compared to other types of hot melt adhesives. The main reason for this is that polyurethane hot melt adhesives lose hydrogen bonds in polyurethane molecules when heated. The resulting crosslinks become a molten viscous liquid, which cools back to its original properties. Therefore, polyurethane-based hot-melt adhesives have excellent elasticity and strength, high adhesive strength, solvent resistance, abrasion resistance, and are suitable for bonding of various materials. PU hot melt adhesives are generally divided into two categories: one is a thermoplastic PU elastomer hot melt adhesive; the other is a reactive PU hot melt adhesive. Thermoplastic PU hot melt adhesives are adhesive films, tapes, or glues made from thermoplastic PU elastomers. PU elastomers are linear block copolymers formed by the addition reaction of polyester polyols, diisocyanates, and chain extenders. It is bonded by heating and melting and then cooling and solidifying, but it does not have a reactive group itself. It only forms hydrogen bonds to form intermolecular forces, resulting in low bonding strength, and also causing heat resistance and solvent resistance. difference. The wet-solid reactive PU hot melt adhesive can overcome these disadvantages and its performance can be compared with solvent-reactive adhesives. Therefore, the wet solid reaction PU hot melt adhesives have been increasingly concerned by the world since the 1980s, becoming the adhesive industry. The best of them. At present, the research and development of the moisture-curable PU hot-melt adhesives has just started in China, and it is necessary to thoroughly and carefully apply the basic research work to promote the localization of the moisture-cured PU hot-melt adhesives. Diphenylmethane diisocyanate (MDI), Huntsman, USA; Polyether 220 (abbreviated as N220), Polyether 330 (N330), Shanghai Gaohua Third Plant; EVA, Shanghai Weisheng Packaging Materials Co., Ltd.; Petroleum Resins C5, terpene resin, provided by Shanghai Fangtian Elastomer Co., Ltd.; Coumarone resin, Shanghai Coking Plant; Rosin GA 90, Arakawa Chemical Co., Ltd. products. The coating machine and heating reactor are homemade. Peel strength tester adopts BLD 200S electronic peel tester produced by Shandong Jinan Languang Electromechanical Technology Development Center. The coated substrate was a commercial canvas. According to the experimental formula, the polyether was accurately weighed in a three-necked flask, stirred, heated, controlled at a temperature of 110Â° C. and evacuated to remove water from the polyether. Cool down to 50Â°C, pass N2 gas protection, add MDI, the reaction temperature should be lower than 100Â°C, and after 2 hours of reaction, evacuate to no bubble, cool and discharge. The tackifier resin, thermoplastic elastomer, antioxidant and other raw materials are added to the reactor, stirred, heated until the tackifier resin is completely melted, and then vacuumed until no bubbles are added, and the MDI prepolymer prepared according to 1.2.1 is added. Stir well. The temperature of the coating machine is constant, and the prepared rubber sample is evenly coated on the canvas and pressed together to form an MDI-based wet-solid PU hot melt adhesive joint. At room temperature, a moisture curing reaction occurs. According to GB/T2791-1995, the T-peel strength test of adhesive joints was conducted on a BLD-200S electronic peel tester. The sample size is 2 x 25 cm and the draw speed is 25 mm/min. The peel strength test method of adhesive is one of the important methods to study the adhesive performance of adhesives. It is suitable for the testing of flexible adhesive joints. The main characteristic is the ability of adhesive joints to resist crack propagation. There are many factors that affect the peel strength of the adhesive, such as the surface treatment of the adherend, the curing conditions, the properties of the adherend, the properties of the adhesive, the peeling speed, the peeling angle, and the like. This article focuses on the effect of the properties of the PU hot melt adhesive itself on peel strength. The moisture-curable polyurethane adhesive is prepared by using a NCO-terminated prepolymer as a base material, combined with a thermoplastic resin, a tackifying resin, and an antioxidant. When the adhesive is heated, it is melted into a fluid and coated on the surface of the object to be coated. The two objects are attached. After cooling, the adhesive layer agglutinates and acts as an adhesive. Afterwards, the moisture adhered to the surface of the adherend or in the air. Reacts with the prepolymer end group-NCO to form a high molecular weight polymer with a polyurethane-polyurea structure, which further promotes adhesion. Urethane linker (NHCOO) and urea linker (NHCONH) are highly polar and constitute a rigid link of the polyurethane molecular structure, giving the adhesive a high strength and heat resistance. In this paper, N220 and N330 mixtures are used as polyol components to prepare prepolymers containing -NCO end groups. It is intended that some crosslinked structures be properly introduced into the linear prepolymer molecular structure to improve the physical and mechanical properties of the bonded joints. Heat resistance, solvent resistance and so on. The effect of N330 addition on the -NCO content in the prepolymer is shown in Table 1. As can be seen from Table 1, as the amount of polyether 330 increases, the -NCO content in the prepolymer decreases. This is because N330 is a trifunctional polyether polyol that reacts with MDI to form a branched or crosslinked structure. The use of different -NCO content of MDI prepolymers for the formulation of the moisture-cured PU hot melt adhesives, see Table 2 for peel strength values. From Table 2, it can be seen that the MDI-polyether prepolymer structure has a greater influence on the peel strength of the hot melt adhesive. The introduction of a certain amount of N330 in the prepolymer significantly improves the peel strength of the hot melt adhesive, but as the amount of N330 further increases, the peel strength of the hot melt adhesive decreases. This is because the trifunctional N330 can react with MDI to form a prepolymer with a branched or cross-linked structure, which improves the cohesive strength and modulus of the prepolymer, so that the hot melt adhesive based on it is used as a base material. The adhesive strength of the joint increases. If N330 is added too much, the degree of crosslinking increases, causing the brittleness of the adhesive layer to increase and the peel strength to decrease. Using a common hot-melt adhesive tackifying resin and a thermoplastic elastomer EVA, a wet-curable PU hot-melt adhesive was prepared to study the effect of the type of tackifying resin on the peel strength of the hot-melt adhesive. Rosin-based resins are the earliest tackifiers and are the most widely used tackifiers in hot melt adhesives. From Table 3, it can be found that the viscosifying effect of rosin GA90 resin on the hot-melt adhesive system is superior to the terpene resin and the Coumarone resin. If the composite tackifying resin consisting of terpene resin and coumarone is used, the peel strength of the hot melt adhesive is 3.7 times higher than that of the terpene resin and the coumarone resin alone. This may be due to the synergistic effect of the two tackifying resins on the adhesive strength. From Table 3, it can also be seen that the terpene resin has better tackifying effect on the moisture-cured PU hot melt adhesive than the C5 petroleum resin. This may be due to the fact that the C5 petroleum resin is a straight-chain hydrocarbon polymer, whereas the MDI-polyether prepolymer has an aromatic hydrocarbon structure in the molecular chain, and the structure is similar, so the prepolymer is mixed with a terpene resin containing a benzene ring structure. The solubility is good, so the effect of the terpene resin on the hot melt adhesive system is better than that of the C5 petroleum resin. (4) When the terpene resin is used in combination with the coumarone resin, the peel strength of the hot-melt adhesive canvas-canvas adhesive joints is improved by nearly 4 times than when either of them is used alone. 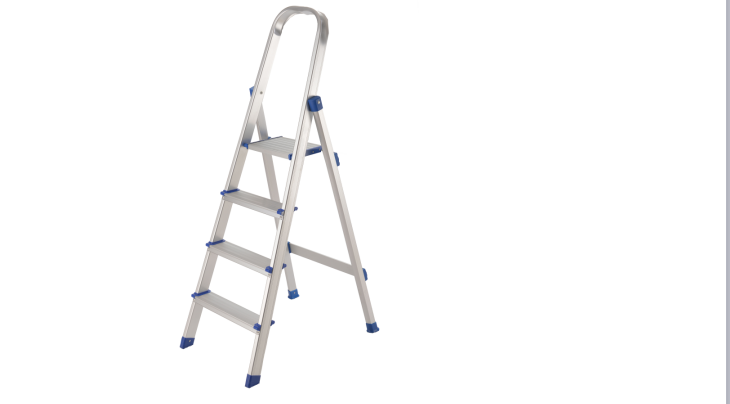 Household Ladder- Steps Ladder - aluminum household stepladder for general use. It`s comfortable, double rivetted treads, heavy duty locking side stays and tubular back legs for strength and rigidity .... featuring anti slip rubber feet and an all aluminum top. 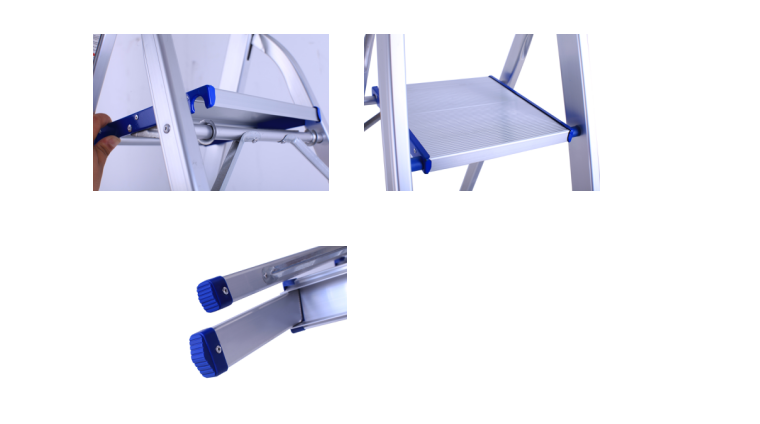 Easy to extend and fold 2 steps , ,3 steps ,4 steps ,5 steps ,6 steps ,7 steps ,8 steps ,9 steps .It`s lightweight and portable aluminum design.Conforming to EN131. The max load of Household ladder is 150KGS. 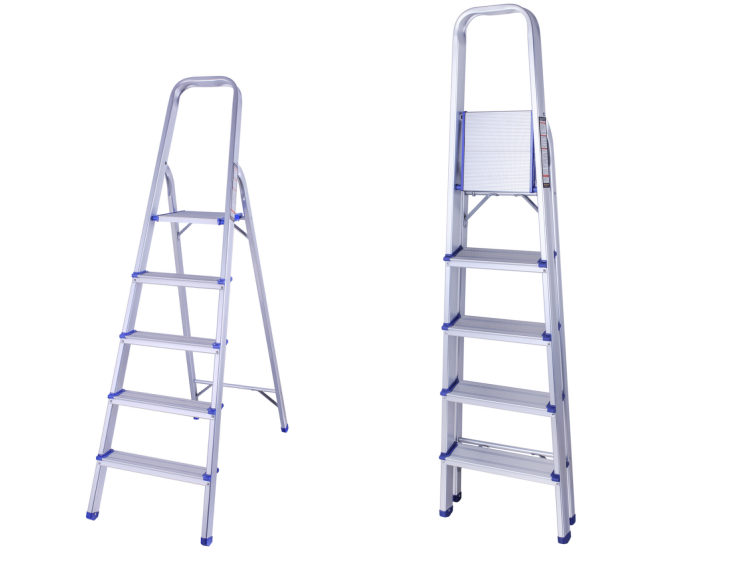 Choose the Household ladder without hesitation as it would be the most convenient assistant for your life .